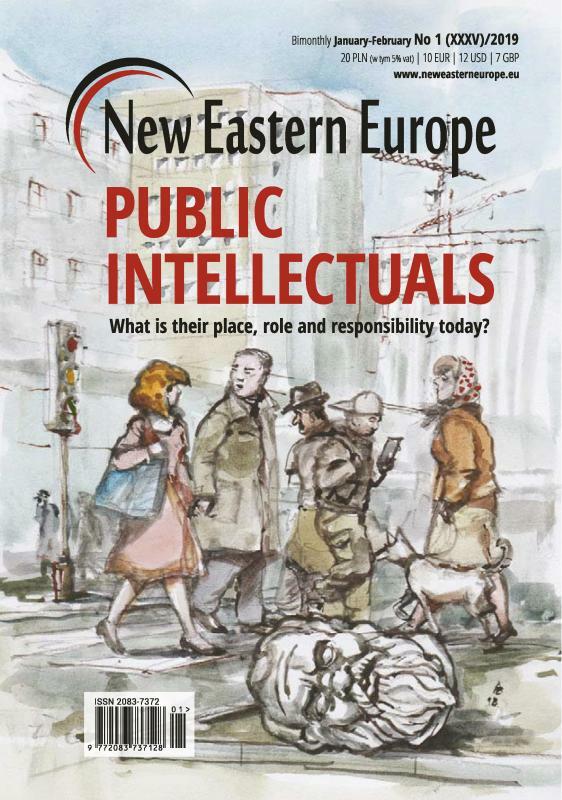 e-Kiosk.pl - New Eastern Europe 1(XXXV)/2019 Public intellectuals. What is their place, role and responsibility today? On December 8th 2018, as we were preparing this issue for print, the 91-year old Russian human rights activist Lyudmila Alexeyeva passed away. She was the founding member of the Moscow Helsinki Watch Group. Alexeyeva devoted over 50 years of her life to promoting and defending human rights, first in the Soviet Union, later from the United States and finally in modern Russia. Famously, her Moscow apartment on Arbat Street turned into a meeting place of Russian intelligentsia and dissidents. When asked once about her work, she said that her goal was never power but human dignity. “I only fought for people to know their rights and defend them,” she explained. To Alexeyeva’s memory and to pay our respect to all defenders of democracy and universal human rights we dedicate the texts in this issue, which tackle the topic of the role of public intellectuals today. We know that without them the peaceful changes of 1989-1991 would have never taken place in this region. Today, 30 years since and worried about the future, we ask: Where are public intellectuals today? New Eastern Europe is a new bi-monthly magazine dedicated to Central and Eastern European affairs. The magazine is the sister edition of the Polish version Nowa Europa Wschodnia, which has been on the Polish market since 2008. Countries in particular focus in New Eastern Europe include Russia, Ukraine, Belarus, Moldova, as well the Caucasus region - Georgia, Armenia, Azerbaijan, Chechnya, etc. Articles in New Eastern Europe focus on a wide range of social, political and cultural issues facing this region. The journal includes original opinion and analytical texts; historical accounts; reports from correspondents in the countries with full colour photos; and reviews of books, music and film about and emerging from Eastern Europe. 5(XXXIII)/2018 What's new with Belarus? 2(XXVI)/2017 - Is the world turning upside down?